William Holcombe was the son of Micha Holcombe and Hannah Hayes. McPherson notes that all of the children listed here are done so for convenience because they all appeared in the census records of the time at that place. The children not in the household are only listed because of their proximity to Virgil in the 1850 cenus of Milan. There are only three children listed that are assumed to be of Virgil and Sophronia. Virgil and Sophronia were enumerated in the 1850 Milan, Monroe Co., MI, federal census. He was a farmer age 62, she was 57. Children in the household were Julius 30, Earl 18, and Albert 14, all born in NY. [S25] Hannah McPherson, Holcombe Genealogy, Page 105.2/Item A-8-1-1-6-1-6. [S25] Hannah McPherson, Holcombe Genealogy, Page 105.2. Elam Holcombe was the son of Joseph Holcombe and Sarah Ford. Lory Holcombe was also known as Loray Holcombe. Lory Holcombe was also known as Lorey Holcombe. He was the son of Joseph Holcombe and Sarah Ford. Lory Holcombe married Leora (?) Served as a private under Sereno Pettibone, Aug 2 to Sept 16, 1813 at New London Ct.
[S25] Hannah McPherson, Holcombe Genealogy, Page 106.2/Item A-8-1-1-6-5-2. Joseph Holcombe was the son of Joseph Holcombe and Sarah Ford. Alva Holcombe was the son of Joseph Holcombe and Sarah Ford. Erastus Holcombe was the son of Joseph Holcombe and Sarah Ford. Eunice Holcombe was born circa 1792. She was the daughter of Joseph Holcombe and Sarah Ford. Eunice Holcombe died in 1838 at Worthington, MA. Betsey Holcombe was born on 3 January 1798 at Granby, Hartford Co., CT. She was the daughter of Joseph Holcombe and Sarah Ford. Betsey Holcombe married Chester Parsons. Arden B. was enumerated in the 1830 Granby, Hartford Co., CT, federal census. Ardon was enumerated in the 1850 Granby, Hartford Co., CT census, a lawyer age 46, boarding in the home of Ezekiel Alderman. A. B. and Caroline were enumerated in the 1860 Des Moins, Boone Co., IA, federal census. He was a lawyer, age 56, she was 35. Children in the household were Sarah L. Soule 16, Henry Soule 14, Franklin Sole 12, Eugene Soule 10, and Sumner W. Holcombe 3. Ardon was enumerated in the 1870 Montana, Boone Co., IA, federal census. He was a retired lawyer, a widower, age 66. The only other person in the household was Sumner, 12. [S25] Hannah McPherson, Holcombe Genealogy, Page 106.2/Item A-8-1-1-6-7-1. [S178] Christina Bailey and Lorraine Cook White, Barbour: Granby, Page 113. [S161] Carol A. Laun, Granby Center Cemetery, Page 81. Anson is recorded in the 1850 Census of Simsbury, Hartford Co., CT, as the owner of real estate, $3,500. [S101] Ruth Cost Duncan, John Case, Page 46. [S344] Joyce A. Cahill Simsbury Cemetery, Page 159. McPherson shows two Catherine Goodrich marriages to Arden Holcombe. Ardon Benjamin Holcombe, son of Levi and Martha (Benjamin) Holcombe (page 106.2); and Arden Holcombe, son of Arden and Rachel (Hoskins) Holcombe (page 190.2). [S243] Rev. Charles Wells Hayes, George Hayes, Page 58. [S25] Hannah McPherson, Holcombe Genealogy, page 151.2. Caroline Augusta White was born on 3 September 1824 at Albany, Albany Co., NY. She married Henry Birdsall Soule, son of Clement Soule, on 28 August 1843. Caroline Augusta White married Ardon Benjamin Holcombe, son of Levi Holcombe and Martha Benjamin, on 8 July 1855. Caroline Augusta White and Ardon Benjamin Holcombe were divorced in 1864. Caroline Augusta White died on 6 December 1903 at Scotland at age 79.
from the Dictionary of Unitarian & Universalist Biography, by Alan Seaburg. Caroline Augusta White Soule (1824-1903), a novelist, poet, religious writer, editor, and minister, was one of the founders and the first president of the earliest national organization of American church women, the Woman's Centenary Aid Association. She was the only missionary sent to Scotland by the Universalist Church, and in 1880 the first woman to be ordained as a minister in the United Kingdom. Born in Albany, New York, Caroline was the third of six children of Nathaniel and Elizabeth (Merselis) White, of whom only three survived to become adults. Her mother, at first a member of the Dutch Reformed Church, was a descendent of one of the first settlers in Albany. Her father, a Universalist, was a mechanic from Hartford, Connecticut. Caroline attended a variety of local schools including, when she turned twelve, the Albany Female Academy. Always a fine student, she received at her graduation ceremony from the Academy in 1841 a gold medal for her essay, "The Goodness of God Not Fully Demonstrated Without the Act of Revelation." A. B. Grosh, minister at the Albany Universalist Church where the White family worshipped, described her at this time as "so small, slender, timid and shrinking that she looked even younger" than her seventeen years. After graduation Caroline was employed, without pay, as the principal of the female department of the Clinton Liberal Institute in Clinton, New York, a secondary school that had been founded in 1831 by the Universalist Church. In 1842 she taught two terms, about seven months, until poor health compelled her to return to her family home in Albany. While in Clinton she worked with principal Henry Birdsell Soule (1815-1852). "Mutual pursuits at Clinton necessarily drew us together—mutual trials begat sympathy, and who does not know that sympathy is the dawn of love," Caroline later wrote. "Ere the first term of our engagement closed, our hearts were one." A farm boy from Cicero, New York, Henry had converted to Universalism while studying at the Clinton Liberal Institute, 1835-37. Encouraged by the pioneer Universalist minister, Stephen R. Smith, he decided to prepare for the ministry. After studying with John T. Goodrich in Oxford, New York, 1838-39, Soule served Universalist societies in Fort Plain, New York, 1839-41; Troy, New York, 1841-42; and Utica, New York, 1843-44. During 1842-43, while serving as principal at the Clinton Liberal Institute, he preached on Sundays in Clinton and Utica. Caroline and Henry were married in Albany by their mutual friend A. B. Grosh. After living in Utica for a year they moved to Boston where Soule candidated, 1844-45, hoping to be chosen associate and successor to the aging Hosea Ballou at Second Universalist Society in Boston. Although his peers regarded him as a talented preacher, he was not chosen for this important position. Poor health limited his career. His remaining pastorates were brief: Gloucester, Massachusetts, 1845-46; Hartford, Connecticut, 1846-50; and Granby, Connecticut, 1851. While in Hartford Caroline helped her husband edit the Connecticut Odd Fellow and started writing short stories—always with a proper and obvious moral—for the Hartford Times and for Universalist magazines. When Henry died of smallpox in early 1852 Caroline Soule found herself an impoverished widow with five children. To earn money she taught school for a while. Her chief income, however, was from writing and work as a religious editor. She prepared a biography of her husband for the Christian Ambassador, which was also issued as a tract. Soon afterward she expanded it into a book, Memoir of H. B. Soule, 1852. As her stories had been well received by the Universalist public, she continued to turn them out for such Universalist magazines as the Rose of Sharon and the Ladies' Repository. A collection of these tales, Home Life; or A Peep Across the Threshold, was issued by the Boston Universalist publisher Abel Tompkins in 1855. While living in Granby she also edited the Rose-Bud, an annual for young people. In 1854, in order to live less expensively, Soule moved her family to a log cabin in Boonsboro, Iowa. During these years she wrote two novels, The Pet of the Settlement, 1860, based on her life on the prairies, and Wine or Water: a Tale of New England, 1862, a temperance story. She considered Tompkins, who published them both, the "guiding star of my literary life." In 1856 Henry Bacon, editor of the Ladies' Repository (published by Tompkins), made her corresponding editor. Bacon's successor, Carolyn Sawyer, appointed Soule assistant editor, 1861-65. In 1863, her children grown up, Soule moved to Albany, New York to get medical treatment for her failing eyesight. In 1867 she moved to Fordham, New York to live in a house that she named "Content" and opened an office in New York City where she continued her writing and editorial duties. She managed, edited, and contributed to the Guiding Star, 1868-79, a semi-monthly for church school pupils. For seven months in 1873-74 she was the chief editor of the New York State Universalist newspaper, The Christian Leader. In 1869 Soule helped organize the Women's Centenary Aid Association (WCAA), created to be a part of the Universalist centennial celebration and to raise money for a new endowment fund, named after John Murray, who had begun preaching Universalism in America in 1770. Elected its president, she traveled across the country urging Universalist women to join and to gather money for the John Murray Fund. By the 1870 Universalist General Convention the women's group had a membership of 13,000 and had raised $36,000. As the Universalist women found that they liked doing significant work for their faith, in 1871 they formed a permanent organization called the Women's Centenary Association (WCA). The WCA (later called the Association of Universalist Women) has proved to be one of the most successful American Universalist organizations. Soule served as president, 1873-80, delivering lectures, addresses, and sermons to any group who would listen to her, mailing Universalist tracts, and raising funds for the WCA, the Universalist General Convention, and several newly-established Universalist colleges. In 1874 Soule preached her first sermon, at the age of 49. On holiday to restore her health in 1875 she visited Scotland. As president of the WCA, which was at that time responsible for raising money for missionary work in Scotland, she was interested in meeting the Universalists there. There she preached, helped with the formation of the Scottish Universalist Convention, and participated in the dedication of a Universalist church building at Larbert. Her first formal pastorate was to the Liberal Christian Association of Elizabeth, New Jersey, beginning in 1876. In 1877 the WCA voted to send Soule as their missionary in Scotland. Arriving the following year, she preached in Dumfernline, Larbert, Braidwood, Lochee, Dundee, and Glasgow, and in England and Ulster as well. In her second year she settled among the Universalists of Glasgow, whom she helped reorganize as St. Paul's Universalist Church. In 1880 the Scottish Universalist Convention ordained her, making her the first woman to be ordained in the United Kingdom. It was to take the Church of Scotland until 1968 to approve the ordination of women. She served as secretary to the Convention, 1881-82. During 1882-86 Soule was back in the United States, helping with the WCA and preaching in Hightstown, New Jersey, 1882-83, and on tour in New England and throughout the West. Marion Crosley, a minister from Utica, New York, meanwhile filled the pulpit in Glasgow. In 1886 Soule returned to Glasgow, where she served until her retirement in 1892. She also filled the Unitarian pulpit in Dundee, 1886-87, while her friend Henry Williamson visited the United States. Williamson, whose church was in one of the poorest parts of Dundee, wrote that "she was most devoted to making the common people share her great hope and faith." The Scottish Universalist Convention made her its honorary president in 1888. After retirement she remained in her adopted homeland, among the people she had served and come to love. "I was always tired, for there was never a chance to rest," she wrote in 1894. "But fatigue in the cause of Universalism is infinitely better than inaction." It is probably Martha Ellen ("Martha") in the household of her grandparents, David and Hilpah (Hayes) Goodrich when enumerated in the 1850 Granby, Hartford Co., CT census. [S178] Christina Bailey and Lorraine Cook White, Barbour: Granby, Page 112. Sumner White Holcombe was born on 29 August 1857. He was the son of Ardon Benjamin Holcombe and Caroline Augusta White. Probably born in Boone Co., IA; enumerated there in the 1895 Iowa state census. [S344] Joyce A. Cahill Simsbury Cemetery, Page 160. Organized the 1st Glee Club in Yale University in his 1st year as a student there in 1859; served as organist for 28 years for the First Church of Christ, Simsbury, Hartford Co., Ct, where he was in the hardware, coal and lumber business for 40 years; wrote many songs, published at Boston, and many articles on historical, scientific and philosophical subjects. When past 60 years old often took canoe trips with sons on the CT river from Windsor, Ct to Long Island Sound. His sons were talented in music. Charles was recorded in the 1900 Simsbury census, district 217, page 13B, line 71, with Sarah and five children. Charles was recorded in the 1920 Simsbury census, district 183, page 12A, line 18. Abby was the only child still at home. [S25] Hannah McPherson, Holcombe Genealogy, page 106.2/Item A-8-1-1-6-7-2-2. [S807] Find A Grave, online http://www.findagrave.com, Find A Grave, database and images (https://www.findagrave.com : accessed 26 February 2019), memorial page for Charles B. Holcomb (1843–25 Feb 1921), Find A Grave Memorial no. 171283313, citing Simsbury Cemetery, Simsbury, Hartford County, Connecticut, USA ; Maintained by Donna Barnes (contributor 47112976) . [S104] DAR DAR Lineage book, Vol. 19:Pg. 91/Item 18241. [S344] Joyce A. Cahill Simsbury Cemetery, Page 161. Anson Munson Holcombe lived at 1407 5th Ave., Bay City, MI. He was born on 21 July 1881 at Tariffville, Hartford Co., CT. He was the son of Charles Brainard Holcombe and Sarah Munson. Anson Munson Holcombe married Mable Hope Stuitz, daughter of Edward Hill Stuntz and Maria A. Collins, in June 1915. Anson Munson Holcombe died in March 1965 at age 83. Graduate of Worcester (MA) Polytechnic Institute 1905; taught electric engineering at Cornell University; was Prof. of electrical Engineering of Case School of Applied Science, Cleveland, OH; served as electrical engineer of Brown Hoist Corp., Bay City, MI and Cleveland OH. The SSDI shows his death but no location. Issued Michigan. [S25] Hannah McPherson, Holcombe Genealogy, Page 106.2/Item A-8-1-1-6-7-2-2-1. 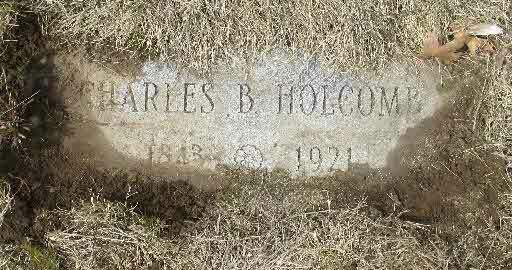 Charles Sheldon Holcombe was born on 23 September 1883. He was the son of Charles Brainard Holcombe and Sarah Munson. Charles graduated from Mass. State College, Amherst, 1905; studied music in Boston, where he became a member of the faculty of Curry School; taught voice and engaged as baritone singer. [S25] Hannah McPherson, Holcombe Genealogy, Page 106.2/Item A-8-1-1-6-7-2-2-2. Arden Benjamin Holcombe II was born on 1 December 1884 at Tariffville, Hartford Co., CT. He was the son of Charles Brainard Holcombe and Sarah Munson. Arden Benjamin Holcombe II married Etholine Cartwright, daughter of Frank F. Cartwright and Mary (? ), on 19 June 1913 at Pittsburgh, PA. Graduated from Worchester, MA, Polytechnic Institute, 1905; became instructor at Cornell University, Ithica, NY; member of faculty of Carnegie Institute, Pittsburgh, later manager Pittsburgh office of Corliss Carbon Co.
Arden B. and Etholine were enumerated in the 1930 Crafton, Allegheny Co., PA, federal census. He was a machinery corp. salesman, age 44, she was 38. Children in the household were mary B. 15, Robert A. 12, and Ann J. 3. Also in the household were sister Abby 38, and father-in-law Frank F. Cartwright, 78. [S25] Hannah McPherson, Holcombe Genealogy, Page 106.2/Item A-8-1-1-6-7-2-2-3. Faith graduated from Mt. Holyoke College, S. Hadley MA; lived in Cleveland, OH, and Boston. Faith Gertrude Holcombe was born on 12 October 1889 at Tariffville, Hartford Co., CT. She was the daughter of Charles Brainard Holcombe and Sarah Munson. Faith Gertrude Holcombe married George Littleton Dawson on 31 December 1915 at Boston, Suffolk Co., MA. Faith Gertrude Holcombe died on 7 February 1917 at age 27. [S25] Hannah McPherson, Holcombe Genealogy, Page 107.1/Item A-8-1-1-6-7-2-2-4. Unmarried and lived with her mother in East Cleveland, Ohio. Abby Humphrey Holcombe was born on 9 September 1891 at Tariffville, Hartford Co., CT. She was the daughter of Charles Brainard Holcombe and Sarah Munson. [S25] Hannah McPherson, Holcombe Genealogy, Page 106.2. Mable Hope Stuitz was born at Bellevue, OH. She was the daughter of Edward Hill Stuntz and Maria A. Collins. Mable Hope Stuitz married Anson Munson Holcombe, son of Charles Brainard Holcombe and Sarah Munson, in June 1915. [S104] DAR DAR Lineage book, Vol. 105/Item 104067. Etholine Cartwright was born in July 1888 at PA.1 She was the daughter of Frank F. Cartwright and Mary (? )2,1 Etholine Cartwright married Arden Benjamin Holcombe II, son of Charles Brainard Holcombe and Sarah Munson, on 19 June 1913 at Pittsburgh, PA.
George Littleton Dawson married Faith Gertrude Holcombe, daughter of Charles Brainard Holcombe and Sarah Munson, on 31 December 1915 at Boston, Suffolk Co., MA. George Littleton Dawson died in October 1918 at Camp Lee, VA.
[S419] Carol Laun, Beneath These Stones, Page 26. Chloe Holcombe was born on 27 April 1790. She was the daughter of Asa Holcombe and Chloe Dibble. Chloe Holcombe died in 1869; unmarried, town pauper.1 She was buried at Poor Farm 2 Cemetery, Granby, Hartford Co., CT.
[S419] Carol Laun, Beneath These Stones, Page 71. Thankful Holcombe was born in September 1791. She was the daughter of Asa Holcombe and Chloe Dibble. Thankful Holcombe married Nathaniel Holcombe VII, son of Adonijah Holcombe and Charity Gillett, on 28 March 1811 at Granby, Hartford Co., CT. Thankful Holcombe died on 1 May 1843 at age 51. She was buried at New Ohio Cemetery, North Colesville, Broome Co., NY. [S25] Hannah McPherson, Holcombe Genealogy, Page 105.1/Item A-8-1-1-3-7-2. [S25] Hannah McPherson, Holcombe Genealogy, Page 105.1/Item A-8-1-1-3-7-3. [S419] Carol Laun, Beneath These Stones, Page 25. [S810] Edwin W. Strickland II, William Buell, 1-8, page 302. [S161] Carol A. Laun, Granby Center Cemetery, Page 129. Harriet Holcombe was the daughter of Asa Holcombe and Chloe Dibble. Harriet Holcombe married Joseph Drake, son of Joseph Drake and Elizabeth Cook; no children.2 Harriet Holcombe married Nathaniel Holcombe VII, son of Adonijah Holcombe and Charity Gillett, on 1 July 1844 at Colesville, Broome Co., NY. Harriet Holcombe died on 7 February 1886 at Tunnell, Broome Co., NY. [S25] Hannah McPherson, Holcombe Genealogy, Page 105.2/Item A-8-1-1-3-7-5. [S578] Frank B. Gay, John Drake, Page 109. Charity Gillett was born on 3 April 1757 at Salmon Brook (now Granby), Hartford Co., CT.1 She was the daughter of Othniel Gillett and Eunice (?) Charity Gillett married Adonijah Holcombe, son of Nathaniel Holcombe IV and Margaret Cossett, on 6 September 1778 at Salmon Brook (now Granby), Hartford Co., CT.2 Charity Gillett died on 23 February 1828 at age 70. [S409] Unknown compiler, 5 October 2002. [S25] Hannah McPherson, Holcombe Genealogy, page 103.2. 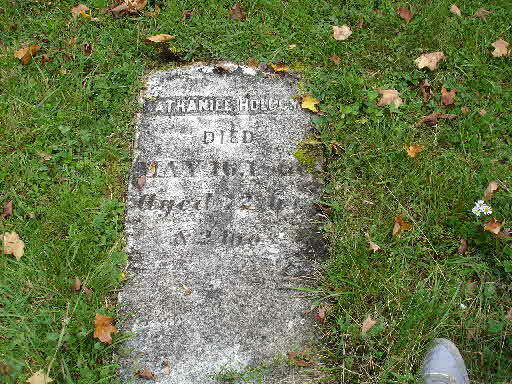 Nathaniel Holcombe VII was born on 30 October 1792 at Granby, Hartford Co., CT.3 He was the son of Adonijah Holcombe and Charity Gillett. Nathaniel Holcombe VII married Thankful Holcombe, daughter of Asa Holcombe and Chloe Dibble, on 28 March 1811 at Granby, Hartford Co., CT. Nathaniel Holcombe VII married Harriet Holcombe, daughter of Asa Holcombe and Chloe Dibble, on 1 July 1844 at Colesville, Broome Co., NY. 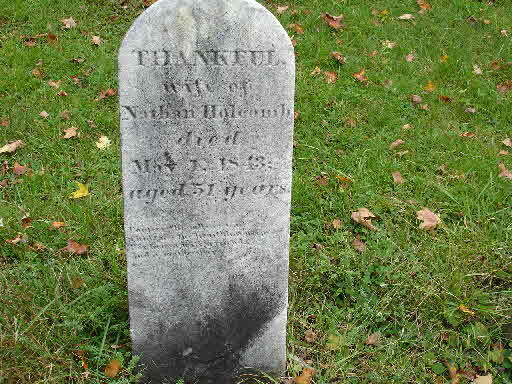 Nathaniel Holcombe VII died on 16 May 1860 at age 67. He was buried at New Ohio Cemetery, North Colesville, Broome Co., NY. Nathaniel was a farmer, 5ft 11 in tall; had dark hair, blue eyes and of light complexion when he enlisted at Granby, August 15, 1814 as a private in Capt. Isaac Phelps' Ct. Co., Col. Ezra Brainerd's Regt; discharged New London, CT Oct 25, 1814; moved to Colesville 1825-26, where he is recorded in the 1850 census. He was a farmer age 60, she was 47. Harriet was pensioned for Nathaniel’s services in the War of 1812 on her oath at New Ohio, Broome Co., NY, May 14, 1878. Harriet and Pamelia were enumerated in the 1860 Colesville, Broome Co., NY, federal census, living alone. Harriet was 57, Pamelia was 38. [S25] Hannah McPherson, Holcombe Genealogy, Page 103.2/Item A-8-1-1-2-7-5. [S23] Jesse Seaver, The Holcomb(e) Genealogy, Page 75. [S419] Carol Laun, Beneath These Stones. Maryette Holcombe was the daughter of Asa Holcombe II and Ada Strickland. The Holcombe genealogy gives his birth as 1825, but the gravestone gives the 1824 date. Family tradition says his death resulted from a broken back after being hit by a bull. Harvey and Maria were enumerated in the 1860 Hartland, Hartford Co., CT federal census. He was a farm laborer 36, she was 24. The only child in the household was C.H. age 3. There were three other children, surnamed Marsden(?) ages 9, 8, and 6. Harvey and Maria were enumerated in the 1880 Hartland, Hartford Co., CT, federal census. He was a farmer, age 58, she was 47. Children in the household were Charles J. 16, Maggie J. 14, Addie M. 10, and Robert A. 5. [S25] Hannah McPherson, Holcombe Genealogy, Page 105.1/Item A-8-1-1-3-7-3-2. [S606] Richard C. Roberts, Roberts Reunion 4, page 69. [S807] Find A Grave, online http://www.findagrave.com, memorial ID 79381944. [S606] Richard C. Roberts, Roberts Reunion 4, page 29. [S818] Edwin W. Strickland II, William Buel, 8-14, page 418. Henry G. Holcombe was born on 20 October 1826. He was the son of Asa Holcombe II and Ada Strickland. Henry G. Holcombe married Phebe Parmenter. Henry G. Holcombe married Abbie L. Winchel, daughter of Talcott Winchel and Maria T. (? ), on 25 January 1869 at Granville, Hampden Co., MA. Henry G. Holcombe died on 16 March 1880 at age 53.2 He was buried at Center Cemetery, Granby, Hartford Co., CT.
Henry and Phebe were enumerated in the 1860 Granby, Hartford Co., CT, census with Edward and Howard. [S25] Hannah McPherson, Holcombe Genealogy, Page 105.2/Item A-8-1-1-3-7-3-3. [S161] Carol A. Laun, Granby Center Cemetery, Page 100. Charles A. Holcombe was born in September 1832 at CT.2 He was the son of Asa Holcombe II and Ada Strickland. Charles A. Holcombe married Martha A. Wilder. Charles A. and Martha M. were enumerated in the 1860 Belchertown, Hampshire Co., MA, federal census. He was a blacksmith, age 31; she was 20(? ), born in VT. Children in the household were George F. 3, and Henry 1. Charles and Martha M. were enumerated in the 1870 Belchertown, Hampshire Co., MA, federal census. He was a blacksmith, age 40, she was 34, born in VT. Children in the household were Henry 10, Ellen 8, William 6, Harriet 4, and Olive 3 months. Charles A. and Maria were enumerated in the 1880 Belchertown, Hampshire Co., MA, federal census. He was a blacksmith age 49, she was 42. Children in the household were Henry C. 22, Nellie M. 19, James W. 17, Hattie G. 13, Olive M. 10, Minnie W. 8, and Freddie E. 6. This census indicates that Charles' wife was "Maria" born in Massachusetts as were both her parents. The two previous censuses indicated that she was Martha born in Vermont. Apparently between 1870 and 1880 Charles remarried. Could Minnie and Freddie be Maria's children? For that matter, Hattie G. makes a first appearance in this census, age 13, does she belong also to a previous marriage for Maria? By 1880 this appears to be a blended family and more research is necessary. [S25] Hannah McPherson, Holcombe Genealogy, Page 105.2/Item A-8-1-1-3-7-3-4. [S606] Richard C. Roberts, Roberts Reunion 4, page 26. William Roberts was born in March 1798 at Nottingham, England. He married Nancy Hoyt Bean. [S606] Richard C. Roberts, Roberts Reunion 4, page 159. [S606] Richard C. Roberts, Roberts Reunion 4, page 30. [S606] Richard C. Roberts, Roberts Reunion 4, page 31. Viola and nancy are buried in the "Holcomb Cemetery" on Pell Road (McCarthy Road), East Hartland, opposite the site of the "Old Place. Viola Adelaide Holcombe was born on 11 October 1852 at East Hartland, CT. She was the daughter of Harvey H. Holcombe and Maria Louisa Roberts.1 Viola Adelaide Holcombe died on 17 October 1852 at East Hartland, CT.
Nancy Adelaide Holcombe was born on 24 May 1858 at East Hartland, CT. She was the daughter of Harvey H. Holcombe and Maria Louisa Roberts.1 Nancy Adelaide Holcombe died on 29 June 1858 at East Hartland, CT.